But the number of everyday museum visitors who make it to the front of the line may be as low as the number of people who get a table at Minetta Tavern via the reservation line. That’s because the door policy is anything but democratic: Every day by 10:30, when the museum officially opens, ten to fifteen people are already waiting inside, having taken advantage of the early access granted to employees. And they aren’t even first on the list, because just before the show begins, Abramovic’s assistant brings in a handful of VIPs who skip the line altogether. 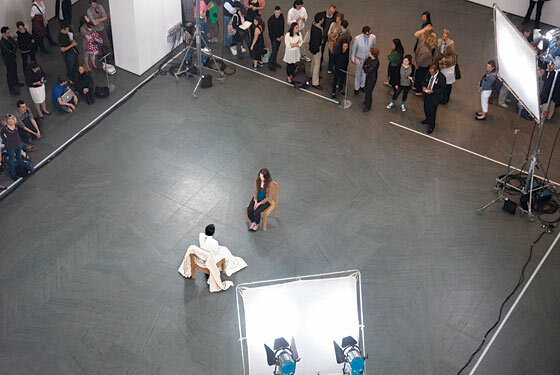 Because some people choose to sit with Abramovic for an hour or longer, this means that, occasionally, not even MoMA employees make it in front of her. Last Thursday, for instance, only nine people sat with the artist, and Björk and her family accounted for a third of them. But according to one MoMA employee, curtailing the staff access doesn’t get to the root of the problem: Abramovic’s assistant. Though this employee (who prefers to remain unnamed in order not to jeopardize his or her job) has tried to take advantage of early staff access, he or she wasn’t able to sit with the artist once — even after an epic wait from 10:20 a.m. until 5:30 p.m., when Abramovic left. Star access isn’t subtle. “There are benches next to the atrium,” according to our informant, “and the VIP crew just pops a squat there until Marina is ready.” That includes friends of the artist, friends of the artist’s assistant, and everyday celebrity visitors like Franco. When guests started to notice — and complain — Abramovic got creative. Last week, the artist agreed to begin her performance early, specifically to accommodate Björk, Matthew Barney, and their young daughter. But no more, says a source within MoMA’s communications office (who also prefers not to be named). “It has been a balancing act to accommodate the wishes of the artist with MoMA’s responsibility to the public,” this source said. “In these final days of the performance, no one will be seated with Abramovic before public hours.” Except, it turns out, Marisa Tomei, who was allowed early access to the artist on Sunday morning.